DIG TWO GRAVES is one of the most beautiful horror films you'll ever see. 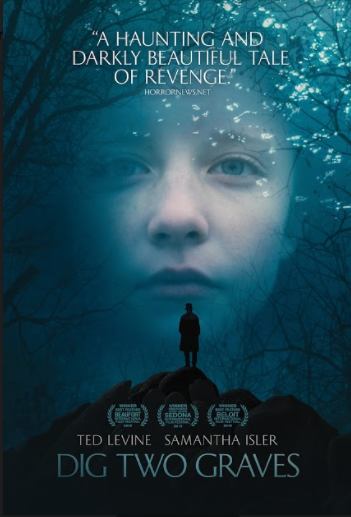 A visually haunting film this is one film where if you can see this on a big screen I suggest you do so. The cast including Ted Levine and Samantha Isler are equally wonderful. Jake (Samantha Isler) loves her brother dearly. When he dies in a swimming accident she is beside herself. Taking comfort in the company of her Grandfather (Ted Levine) she struggles to move on. One day while out on a walk she meet three strange men who live in a backwoods cabin. For a price they will bring her brother back from the dead. I love the look and the feel of this film. I think it's a near perfect film on all of the technical levels. The problem for me is the plot doesn't wholly know what it wants to be. Largely a horror film DIG TWO GRAVES adds in a coming of age tale as well, While the two parts of the story worked for many people I know, it never quite jelled for me with the result that the pacing felt off and the chills are never fully realized. This isn't to say that DIG TWO GRAVES is a bad film, it's not, rather it's more a film not quite the sum of it's excellent parts.